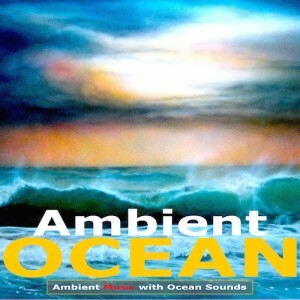 This Ambient Music album with Ambient Ocean Sounds is a beautiful, seamless combination of atmospheric sounds of the sea and ambient music. I think the reason why this is one of my most popular albums is the translucent blend of nature and music. Ambient Ocean is at once contemplative and soothing. It’s oceanic quality will enhance any space used for therapy or healing, and chill-out home listening. I made this album because I love the ocean and its breath-like waves, sometimes smooth, ethereal, sometimes moody. I love looking at the ocean surface, the way it changes colour and light, it’s presence influences everything I do. This is evident in the mellow easy listening “Ethereal Chime” to the ambient dub of “Deep Mind Ocean Dub” to the therapeutic “New beginnings”. Emotive, therapeutic mood music; rich, subtly melodic orchestrations and ambient pads of synthesizers, piano or chiming electric piano. I added a beautiful cello and mezzo soprano on”Lullaby”, to bring a haunting, melancholic closure to the album. “New beginnings” & “Deep Mind” track themes from the album Cosmic Waves. I also mixed an alternate easy listening version of “Dolphin Dreaming”on Sky Cafe.